As a Gamemaster, you just can’t have something planned for every eventuality. Perhaps you have to step in to run something on short notice or the normal group can’t meet so you want something to change the pace. The Cthulhu Hack offers a simple system for investigative horror, but where to get the horror? From Unformed Realms offers you a gathering of random tables to provide a springboard for your creativity just when you need it most. For those moments when your players have taken the inevitable path away from whatever you have planned, From Unformed Realms provides the ideal tool for conjuring up a flash of inspiration. In 20 horror packed pages, the supplement provides myriad options for the random creation of horrific nightmares and unnameable monstrosities. You can either roll randomly with a 6-sided die or flick to a random page and choose a numbered section, then inflict the content on your appreciative players. The supplement contains references and monsters based on the Horror genre. The book does contain references to acts of fictional violence and biological functions, but nothing unsuitable for someone sitting down to play a game of Lovecraftian investigative horror in the first place! 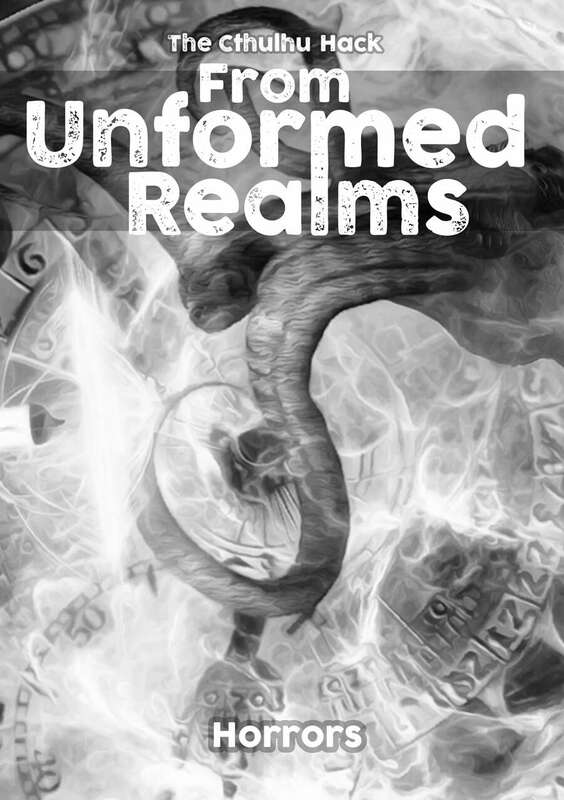 From Unformed Realms is a system-free supplement, easily adapted it to your favourite game system or campaign setting. Some material previously released under the title Consult Appendix Z. Consult Appendix Z - No 1: Brace For Impact! The format at the moment is a single page landscape with two columns - which admittedly looks like a two-page spread. I'll review the format and look to provide an alternative. Thanks for the feedback.